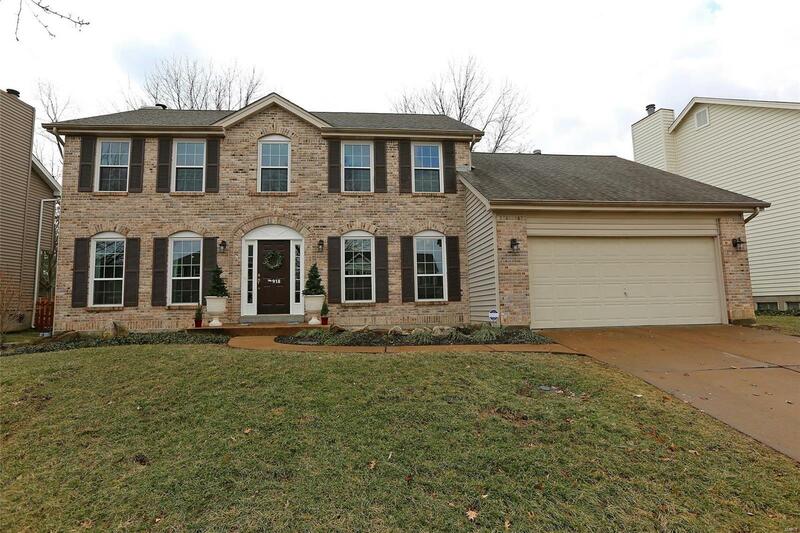 Hurry to see this beautifully updated 4 bedroom two-story home on a great lot w/fantastic backyard entertaining area in AAA Rockwood School District! Some of the special features of this home include newer wood laminate flooring on most of the main level, modern lighting & paint tones throughout, tilt-in vinyl windows, an open floor plan, main floor laundry w/nook & finished lower level! The entry opens to formal living and dining rooms, and leads to the family room w/built-in bookcases and gas log fireplace. The kitchen is gorgeous w/vaulted ceiling, grey cabinetry, granite counters, center island, planning desk & butler's pantry. A slider opens to a large outdoor entertaining area, partially covered & complete w/fire pit area! Upstairs the vaulted master suite is spacious, w/walk-in his/hers closets and luxury bath w/separate tub and shower. The addl 3 bdrms/1 bath complete the upstairs. The finished lower level is perfect having a large rec rm and/or office - endless potential.